The Castro in San Francisco could soon be getting its own farmer's market. Another farmer's market? Yes! This one opened in April at Noe & Market, and so far, as they say, people love it on Yelp. No big surprise -- it looks lovely. Have you stopped by it yet? How does it compare to all of the other new ones we've been seeing lately? 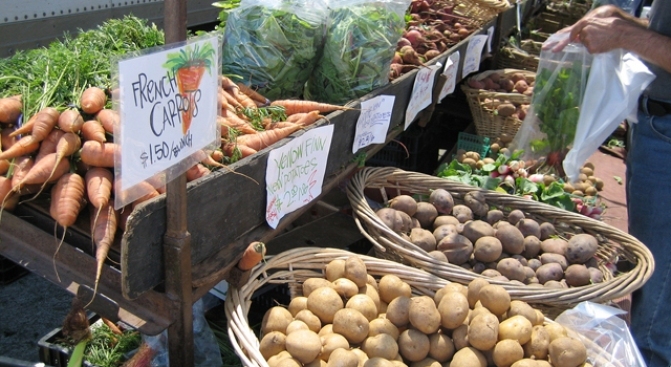 And why are farmers' markets suddenly hot hot hot? We were going to suggest that Depression 2.0 is responsible for an uptick in buying farmer-food, but this stuff tends to be more expensive than the assembly-line junk you get in supermarkets, so who knows what the real reason is. Of course, the usual suspects are there: vegetables, cheeses, blueberries, men walking dogs. We are above making a joke about fruits, and will instead make reference to overflowing baskets. The City is already bursting with Farmer's Markets from the Ferry Building to the Alemany Farmer's Market in Bernal Heights. It was only a matter of time before the Castro got its own.